The Wellness Center and the Office of Student Development and Retention have combined to form the Student Wellbeing Office. After two years at No. 1, Rice dropped to No. 2 for "Happiest Students" in the Princeton Review's "The Best 378 Colleges" rankings, while rising from No. 2 to No. 1 for the fifth time in the "Best Quality of Life" category. 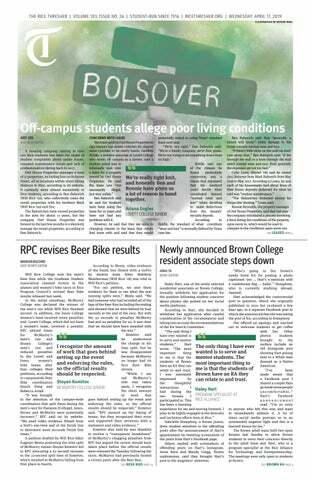 The Thresher is concerned by the administration's decision to amend the amnesty policy to exclude people who provide underage students with hard alcohol from protection (see story, p. 1). This year in theater, Rice students showed us Shakespearean equality, 19th-century English country homes, the Roaring '20s, the mysteries of death, a musical doomed to fail, the danger of stamp collecting, and much more. 2012-13 marked a series of strong achievements in theater in everything from student works to the Rice Department of Visual and Dramatic Arts productions. The Thresher commends the administration for incorporating many of the Alcohol Policy Advisory Committee's recommendations into its proposed changes to the alcohol policy as announced April 15 (see story, p. 1). The following were noted at the meeting of the Student Association on Apr. 15. National Science Foundation director Subra Suresh speaks about STEM education in the U.S. and gives advice on getting involved in science policy.